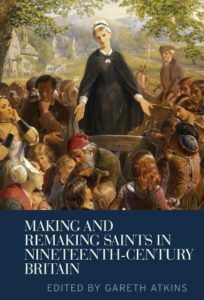 July saw the publication of my new edited book, Making and Remaking Saints in Nineteenth-Century Britain. Containing essays by fifteen authors on the reception of subjects from Paul and the Virgin Mary to William Wilberforce and Thérèse of Lisieux, it argues that saints did not fade away but took on fresh significance in the nineteenth century. Protestants as much as Catholics made saints, canonizing them unofficially in cheap print and pious kitsch. Agnostics and unbelievers appropriated religious language to sanctify figures like John Stuart Mill and Charles Darwin. Historians, psychologists and sociologists were fascinated by what charismatic figures and their cults said about past societies and present beliefs. It’s difficult to sum all this up in one image. But when I stumbled across Edward Henry Corbould’s Dinah Morris Preaching on the Common (c. 1861) it was instantly clear that this had to be the front cover. Fans of George Eliot will recognize it as a scene from her hugely successful first novel, Adam Bede, published in 1859. In its first year Adam Bede sold over 10,000 copies, making Eliot’s name almost overnight as a commentator on manners, morals and the human condition. Enthusiasm for it extended to the highest in the land. It was read avidly by Queen Victoria and quoted frequently by Prince Albert. So taken were they with it that they commissioned Corbould to produce a pair of watercolours from it. And this is one of them. Anyone familiar with Adam Bede will know the story. On a sunny evening on Hayslope Green, the young Methodist preacher Dinah Morris addresses the assembled villagers. It is a warm moment, richly and movingly described, drawing on affectionate memories of Eliot’s aunt Elizabeth Evans, a pioneering female preacher in her day. If this is a saint, it’s an emphatically Protestant one. Her clothes are plain and even shabby; slightly Quakerish. Her composition and pose, however, strongly echo Catholic iconography surrounding the Virgin Mary. Specifically, Dinah appears here as mater misericordiae: mother of mercy. The triangular composition draws our eyes up to the face – the only part of the painting that the critics liked – with the tree and sky creating a sort of halo behind it. ‘It was one of those faces’, wrote Eliot, ‘that make one think of white flowers with light touches of colour on their pure petals.’ Like Mary, Dinah radiates affective power – old and young, male and female, different social classes listening with rapt attention. ‘“Dear friends,” she said, in a clear but not loud voice, “let us pray for a blessing.”’ The impact of the image lies in the fact that she addresses the viewer as much as and perhaps more than any of the figures in the painting. ‘Paint us an angel’, exclaims Eliot’s narrator, ‘but paint us yet oftener a Madonna.’ Corbould clearly took this very literally indeed. These layers of meaning become still more interesting when we consider Eliot’s own beliefs. She had long departed from the evangelicalism of her upbringing, and from orthodox Christianity more generally. But this didn’t mean that she had abandoned the notion of religion completely. Thanks in part to the French Positivist Auguste Comte, she was fascinated by the idea that ‘religion’ might be retooled for modernity by stripping it of its supernatural trappings and focusing instead on the moralizing potential of human relationships. ‘Immortality’ was not about going to heaven but living on in others through one’s deeds and words. It’s not surprising that this insistence that individuals might somehow connect with one another through thoughts and feelings (‘subjective assimilation’), even across time and space, made her sympathetic to the reverence felt for saints in past societies. Indeed, Eliot’s humanism could sound decidedly Catholic. ‘Saints’ were as necessary in the nineteenth century as they had always been. As one protagonist in Adam Bede comments, ‘I could worship that woman’. Eliot would have had no problem with his doing so. Of course, this is only one facet of the book. But taken as a whole, it shows that saints were not the preserve of gothic revivalists in art and architecture. Nor was the language of sanctity merely a quaint survival, a shell that the intelligentsia were beginning to outgrow. If saints were ubiquitous in our period it was because there was such fertile disagreement about what they stood for. Against the black-and-white binary of ‘faith versus doubt’ that has long held sway in Victorian studies, this book reveals the multifarious and messy ways in which belief and unbelief continued to cross-pollinate one another throughout the century. Gareth Atkins is a Postdoctoral Research Associate at CRASSH and Fellow and Director of Studies in History at Magdalene College, Cambridge. Making and Remaking Saints in Nineteenth-Century Britain is available now.